Following on from chatting about my morning routine, I thought I’d share my current evening routine too. I’ve been introduced to some amazing products over the last few months (perks of working for a beauty company) and I am absolutely loving my evening routine right now. I really like taking my make up off with oils and balms. I am lazy,and I like being able to remove my eye make up and my face make up in one go. The DHC Cleansing Oil is amazing at taking everything off. I used to use the Shu Uemura oil so I am pretty happy to have found a (slightly) more affordable option. 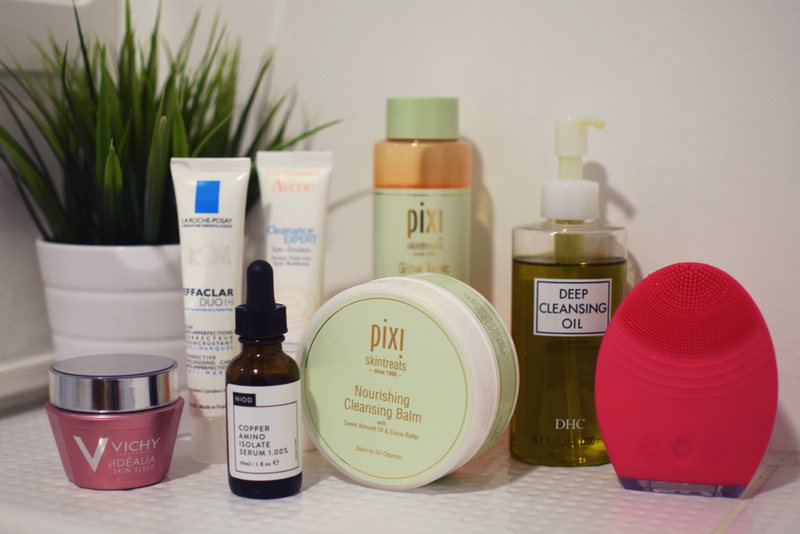 For days when my skin is extra dry, I love the Pixi Nourishing Cleansing Balm*. It smells amazing and takes off every bit of make up. Both of these need to be applied to a dry face, and the Pixi Balm needs to be wiped off with a muslin cloth whilst the DHC Oil emulsifies with warm water. After taking off my make up, I give my skin a proper cleanse. This has been made SO much better thanks to my FOREO Luna. Seriously, this is amazing. Normal cleansing brushes feel a bit icky to me, like they never clean out properly, but this is really hygienic and rinses totally clean every time. It is also way less harsh than the normal cleansing brushes but leaves my skin so clean. I’m currently trying out a few cleansers, but the Balance Me Pure Skin Face Wash and the Avene Cleansing Foam are on rotation right now. The final cleansing step is my absolute favourite: the Pixi Glow Tonic*. Total cult product and I was ridiculously happy to hear they were stocking it on HQ Hair. It really does feel as amazing as everyone says. My skin really doesn’t react well to alcohol toners so this is a godsend and I want to use it forever, thank you please. Gimme the glow. The evening is when I tend to apply most of my more targeted skincare. I have already mentioned my love for the NIOD Copper Amino Isolate Serum*, and I use that morning and evening before anything else. For treating any blackheads or skin problems, I have been using the La Roche Posay Effaclar Duo+ at least a year and I actually can’t do without it. I am trying out the Avene Cleanance Expert as a comparison right now and the Avene feels a little richer on the skin although it is meant to target blackheads and blemishes in a similar way to the Effaclar so I am intrigued to see how that goes. I’ll have to let you know whether it can ever replace my favourite. Finally, because I am getting over the hill, I have started using to anti-ageing night care. The NIOD Serum is designed to help longterm and the Vichy Skin Sleep gives some immediately visible effects. I definitely notice my skin looking fresher and plumper in the morning. Slather a layer on and I can pretend those early wake ups and busy days aren’t taking their toll! 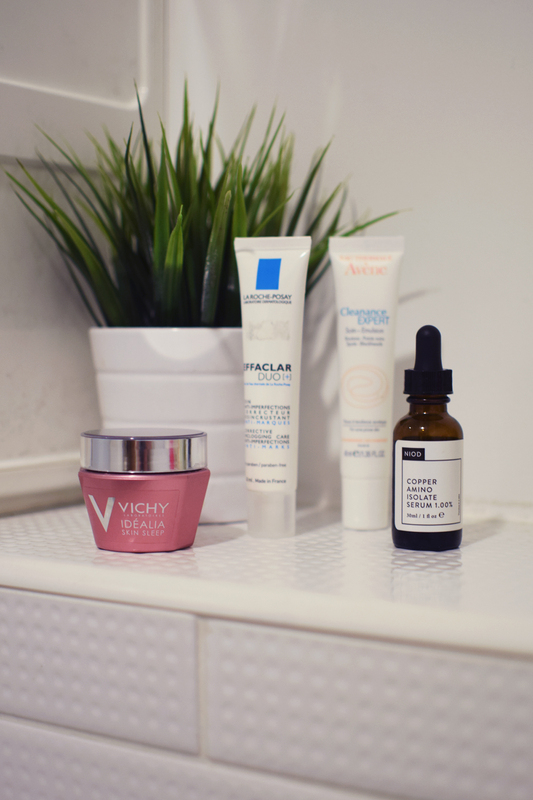 What do you think of my evening skincare favourites? Any of your favourites in there?